Have you heard of Cook’s Illustrated? They are my go-to recipe source when I want exceptional results and delicious recipes. Cook’s Illustrated is the brainchild of a bunch of science nerds who love to cook – just like me. They perfect basic recipes – like pie crust or Thanksgiving turkey – through countless recipe “experiments” until they have the ultimate of whatever dish you’re looking for. 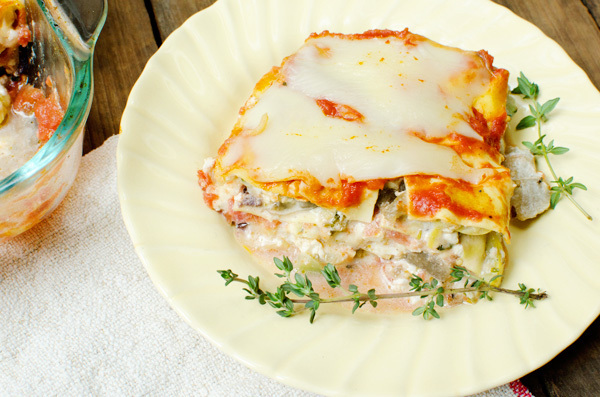 They come up with innovative techniques to fix a typical recipe flaw – like with this recipe for vegetarian lasagna. 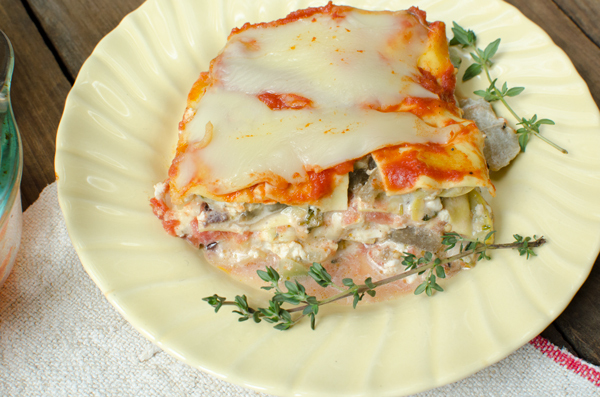 Typical vegetarian lasagna has a variety of issues, from soggy veggies to goopy ricotta. 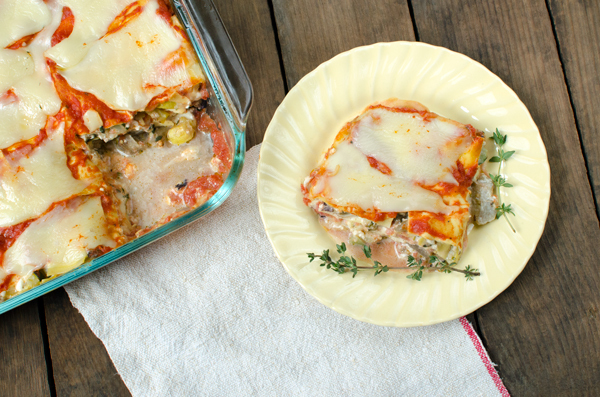 This recipe of theirs fixes that, by precooking the veggies and replacing ricotta with tangy cottage cheese. I don’t normally share Cook’s Illustrated recipes on the blog, as it is a paid subscription service. 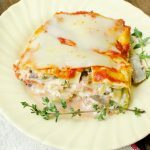 I’m making an exception with this post to share one of my favorite recipes for their vegetarian lasagna because I want to spread the word about this awesome resource for chefs of all experience levels! I am absolutely not affiliated with Cook’s Illustrated in any way – other than being their biggest fan! Check it out here. Make the No-Cook Tomato Sauce: Whisk all ingredients together in a bowl; set aside. Make the No-Cook Cream Sauce: Whisk all ingredients together in a bowl; set aside. Make the Lasagna Filling: Toss eggplant with 1 teaspoon salt in large bowl. Line surface of large plate with a double layer of coffee filters or paper towels and lightly spray with vegetable oil spray. Spread eggplant in even layer over filters. Wipeout and reserve now-empty bowl. Microwave eggplant, uncovered, until dry to touch and slightly shriveled, about 10 minutes, tossing once halfway through to ensure that eggplant cooks evenly. Let cool slightly. Return eggplant to bowl and toss with zucchini and squash. Combine 1 T. oil, garlic, and thyme in small bowl. Heat 2 T. oil in a large skillet over medium-high heat until shimmering. Add half eggplant mixture, salt, and pepper; cook, stirring occasionally until vegetables are lightly browned, about 7 minutes. Push vegetables to sides of skillet; add half of the garlic mixture to clearing and cook, mashing with spatula, until fragrant, about 30 seconds. Stir to combine garlic mixture with vegetables and transfer to medium bowl. Repeat with remaining eggplant mixture, 2 tablespoons oil, and remaining garlic mixture. Return skillet to medium-high heat, add remaining teaspoon oil, and heat until shimmering. Add spinach and cook, stirring frequently, until wilted, about 3 minutes. Transfer spinach to a paper towel-lined plate and drain 2 minutes. Stir into eggplant mixture. Spray 13 by a 9-inch baking dish with vegetable oil spray. Spread 1 cup tomato sauce in bottom of baking dish; shingle 4 noodles on top of sauce. Spread half of the vegetable mixture over noodles, followed by half of the olives, half of the cream sauce, and 1 cup of mozzarella. Repeat layering with 4 noodles, 1 cup tomato sauce, remaining vegetables, remaining olives, remaining cream sauce, and 1 cup mozzarella. Place remaining 4 noodles on the top layer of cheese. Spread remaining 1 cup tomato sauce over noodles and sprinkle with remaining 1 cup mozzarella. Lightly spray large sheet of aluminum foil with vegetable oil spray and cover lasagna. Bake for 35 minutes at 375F on the middle rack of your oven, until bubbling. Cool on wire rack 25 minutes. Cut into pieces, sprinkle with basil, and serve. Cook’s Illustrated recipes tend to be more work, but they are always worth it! I’ll have to try this one out. My dad always makes their mushroom lasagne, super delicious! I’ve made this three or four times, and it is indeed THE best lasagna I’ve ever had. But MAN, is it a pain in the neck to make! It takes HOURS. Luckily, the sauces can be made and the cheese grated ahead of time. It also leaves your kitchen one hellacious mess. I recommend having an assistant to keep your sink and counters tidy. I was hoping this recipe was a hack of the original. Since it’s so much work, I’ll probably never make it again. OMG I HEAR YOU! It’s such a pain and literally every dish in your kitchen will be dirty but it’s SO WORTH IT! 🙂 I’m so glad it gets better with time making it perfect for leftovers so we make heaps in one go and enjoy it all week long.